Hula girl, hula Jesus, hula Homer widget. Is there a better alternative to Hula Girl? Is Hula Girl really the best app in File Management category? 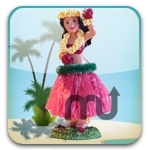 Will Hula Girl work good on macOS 10.13.4? What dashboard is complete without a dancing Hula Girl? This widget contains several dancers including a Hula Boy, Girl, Jesus, and Homer Simpson.